Transparency Market Research (TMR) has published a new report titled, “Endoscopic Clips Market - Global Industry Analysis, Size, Share, Growth, Trends, and Forecast, 2018–2026”. According to the report, the global endoscopic clips market was valued at US$ 355.5 Mn in 2018 and is projected to expand at a CAGR of 7.1% from 2018 to 2026. Inclination toward minimally invasive procedures, wide usage of endoscopic clips for hemostasis, and rise in acceptance of endoscopic clips are anticipated to boost the growth of the global market from 2018 to 2026. Emerging markets such as India and China are experiencing rapid economic growth. Hence, the focus has shifted toward improved health care services in these countries. Governments are spending on health care infrastructure, thereby increasing access to advanced techniques such as minimally invasive procedures. Therefore, global companies such as Olympus America, Johnson & Johnson, Stryker, Medtronic, and Boston Scientific are focusing on Asia Pacific to increase market share. Technological innovations in medical imaging devices have expanded the scope of medical devices, and thereby increased the customer base. Johnson & Johnson gained critical pre-marketing approval for the use of computer-aided surgical sedation devices in endoscopic procedures. The devices are now available to 15 million patients in the U.S. Apollo Endosurgery launched a second-generation OverStitch endoscopic suturing system, which will be beneficial for patients that have undergone endoscopic procedures. Robot-assisted endoscopic procedures have led to a paradigm shift in the endoscopic devices market. Intuitive Surgical is a pioneer and market leader in this technology. Several companies are striving to increase share in the robot assisted endoscopic procedures segment. Minimally invasive diagnostic and surgical procedures using robotic technology are adding value to the market. These technological innovations are boosting demand for endoscopic devices among end-users, which is likely to drive the global endoscopic clips market. MUSE, manufactured by Medigus Ltd., is used in fundoplication procedures and requires no abdominal incision. It received clearance from the FDA and the CE mark in 2014. This is likely to provide a new direction to the treatment of GERD. Similarly, endoscopic clips have become one of the most important accessories in therapeutic practice due to technological advancements. Therefore, technological advancements are expected to augment the global endoscopic clips market. North America is anticipated to dominate the global endoscopic clips market during the forecast period. The region is estimated to account for 38.4% share of the global market by 2026. Advancements in current techniques, demand for endoscopy products, and increase in usage of endoscopy clips in hemostasis and non-hemostasis applications are projected to drive the endoscopic clips market in North America in the next few years. Rise in awareness and educational campaigns are attributed to North America’s dominance of the global market during the forecast period. The U.S. Government is also undertaking initiatives to reduce the incidence and prevalence of gastrointestinal diseases (GI) such as colorectal and pancreatic cancers, inflammatory bowels disease, and gastroesophageal reflux disease (GERD) by spreading awareness about these diseases. Rise in per capita income and rapid increase in the geriatric population are the key factors expected to drive the market in the U.S. in the near future. Favorable reimbursement policies is another key factor likely to fuel the growth of the market in the country during the forecast period. 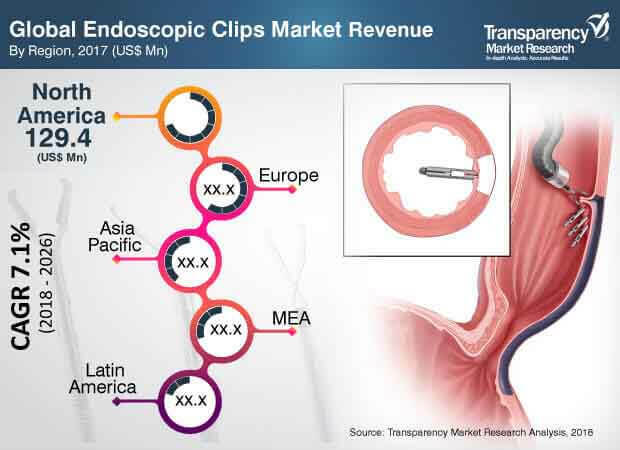 Additionally, mergers and acquisitions by key players present significant opportunities in the endoscopic clips market in the U.S.
Advanced techniques are being developed to minimize hospital stay, side effects, and improve quality of life. Shift from traditional methods/surgeries to minimally invasive surgeries (MIS) is a significant revolutionary step. Minimally invasive surgical procedures such as endoscopy offer advantages such as less pain, faster recovery, small incision, reduced blood loss, and cost savings. However, skilled surgeons are required because the process involves challenges such as restricted vision, difficulty in handling instruments, and proper hand-eye coordination. In order to increase the adoption of endoscopy devices, manufacturers conduct various training programs for medical professionals on the use of these devices. Numerous research studies have also demonstrated the advantages of MIS over open surgeries. Most manufacturers train surgeons to perform minimally invasive or endoscopy surgeries. This helps the surgeons to acquire hands-on experience in using the devices and performing surgeries. This is an upcoming trend and is expected to have a moderate impact on the market in the near future.